1. Feminine beautiful leather with cute little bowknot gloves. 2. This sheepskin gloves are very soft and flexible, the lining is comfortable and warm. 3. The ladies gloves are well-made inside, sturdy and well-stitched, perfect for wearing in cold days. 4. The gloves are beautifully crafted, comfortable and fashion in daily wearing. 5. Top quality genuine leather gloves, perfect for casual or dress use. 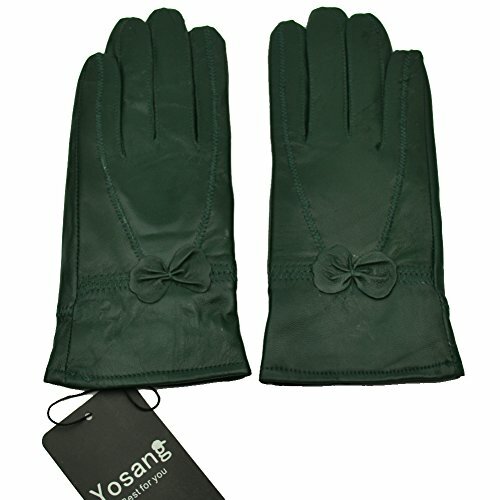 Yosang luxury lined gloves, great for ladies wearing in winter, protecting wrist warm, fashion and soft leather, comfortable fitting and good looking. The soft fleece lining keeps you warm and comfortable while you embrace your winter adventures. The leather gloves are available in classic black and other distinctive colors, and THREE styles, please check the pictures before purchase. If you have any questions about this product by Yosang, contact us by completing and submitting the form below. If you are looking for a specif part number, please include it with your message.